During the turn of the century thrill seeking and being a daredevil was both exciting and profitable. The latest thing was trying to ride over Niagara Falls in a barrel! Taking the plunge was a 50/50 chance at life and death. After hoaxes and Victorian shenanigans, the falls were finally tamed for the first timeâ€¦by a woman! Annie was 63 years old when she accomplished the task, although she told reporters and sight seers that she was in her forties. She was an unemployed schoolteacher and quite destitute. She figured if she died in the attempt her unhappy life would be ended, but if she made it then fame and fortune would roll her way. She made the attempt, on her birthday October 24th, 1901. She succeeded, but never gained the fortune she was so looking forward to. 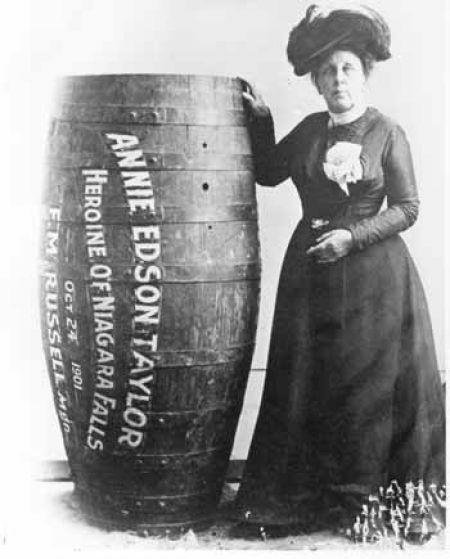 Her manager stole her barrel and she never recovered it. She did do a few autograph signings, but 20 years later she died destitute. Learn Something: Did you know you will be fined for trying to make the attempt? Due to the serious amount of suicide attempts there is now a fine imposed for â€œstunting without a licenseâ€. Stiff fines and penalties await anyone brave enough to tackle the falls. Her manager is a ballhair!